bravo for the pics, Robin. I have never seen birds like these before, mind you, I’m not very good at birds, but I loved reading about nature following its millenium course : this appointment with the waxwings is one of marvel. Thank you for sharing. Oh my goodness! They are fabulous, and the images are spectacular! Well done!!!!! Just lovely, I enjoy these birds when they come to our crab apple trees. I really wish I could get my eyeliner on that straight. I never see them at my house but I will look in the next three weeks on the junipers as I have heard that they like juniper berries. Great shots and I am glad they solved your to do dilemma. Beautiful post with awesome pictures! What I find even more amazing is your ability to identify the birds…impressive! I can identify woodpeckers not by sight but by the sound they make when they are pecking at my house. Oh, and the robins, because they visit my garden in the spring looking for worms. We all have to start somewhere. Beautiful. The lesson here is don’t listen to the teachers — it does pay to sometimes just gaze out the window. Those hawthorns remind me of my neighbor’s winterberries. 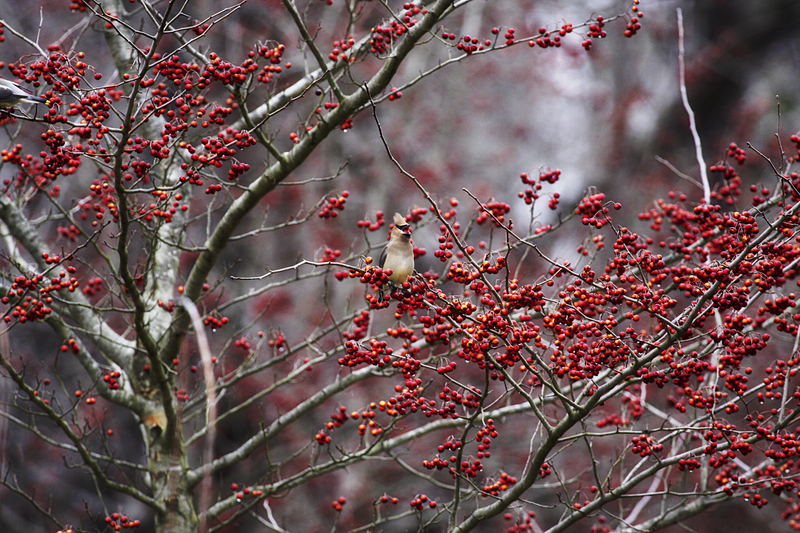 We have native hawthorns in the woods, but I have never grown any ornamentally. I would like to attract the birds where I can see them from the house. More research is in order. Wow–such gorgeous photos! I adore bird watching but find that as soon as I locate my camera, they’re gone. Lovely shots–thanks for sharing! These are one of my very favorite visitors here at Our Little Acre, though I haven’t seen them here in awhile. Your photos are beautiful, Robin! @Carol haha, that’s a good excuse to tell your teacher when you got caught looking out the window and not paying attention. Enjoy life even in the smallest detail. Love the pictures robin, we don’t get that kind of birds around here though, i wish they would visit. What we get mostly here are crows and vultures. nah, kiddin, but we also get some annual visits from migratory birds (I have no idea about the names of their species). We enjoy looking at them perching at our trees in the garden from time to time. I’m a budding gardener and inherited a semi-urbanized area to grow a garden. I get a lot of tips and ideas from blogs like yours and this site: http://danthegardener.com/ Have a great spring! Just beautiful! We are all very….glad that you couldn’t find something to do that day! Now we can all enjoy the beautiful birds! Loved the bottom picture of the waxwing eating the Berry. Caught it it at exactly the right minute. Looks the sort of image that could win a photo competition. Hi Robin, Just wanted to pop it to say hi and let you know how happy I am to have discovered your blog. I’m in the process of designing a potager and your pictures and information have been most inspiring. Looking forward to reading your new posts. 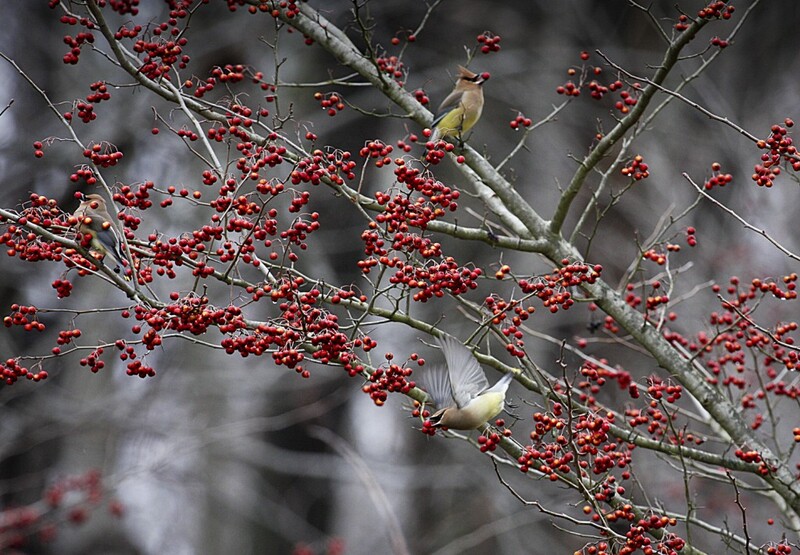 The pictures of the Cedar Waxwings in the Hawthorne are wonderful. We get them occasionally. 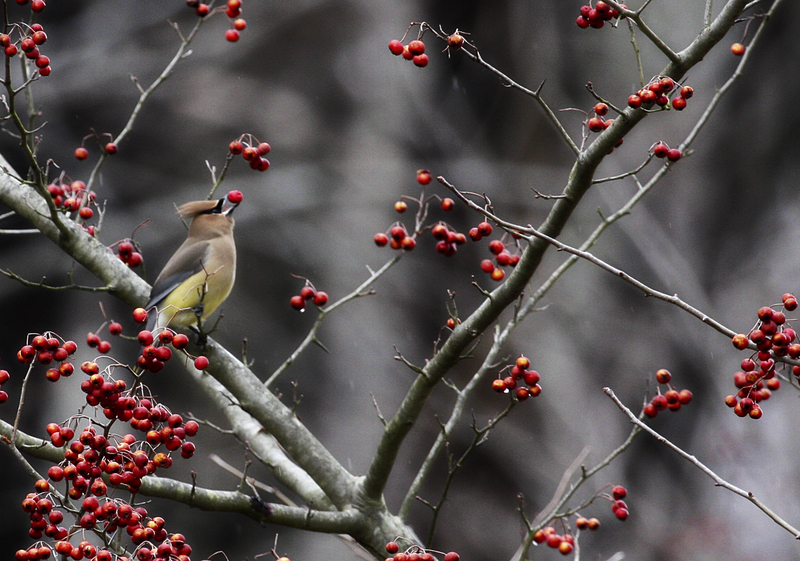 And last year a huge flock of them descended upon my Dogwood and ate most the berries that were there. A few days later a flock of robins finished off what was left. Awesome picture.Thank you for sharing this to us.. Incredible photo shots here. These birds are very unique and are just examples of the beauty of our nature. I like to watch birds as you are. They give me life power and happiness. Beautiful! Thanks for sharing, teaching and inspiring. I summer where hawthorns grow naturally, albeit sans the lovely blooms and plethora of red berries. The ones behind the ‘Big’ garden are ancient, gnarled and a good props for one of the Hobbit movies. They do have their own charm. I can see though the King Hawthornes lining the long drive to the farm though. It would provide good viewing in and out those long northern winters. If we spied a Cedar Waxwing enroute, an added bonus! I don’t believe much of the drive is visible from the house. Maybe some creative planting will remedy.